Whenever the start of fall is peeking around the corner, there is a sense of certain reliable expectations that fill the mind while awaiting the seasonal shift. Days will get shorter and become darker, faster. Evening and morning air will take on a noticeable chill. Most signature of course, leaves on trees will change color and fall to the ground. 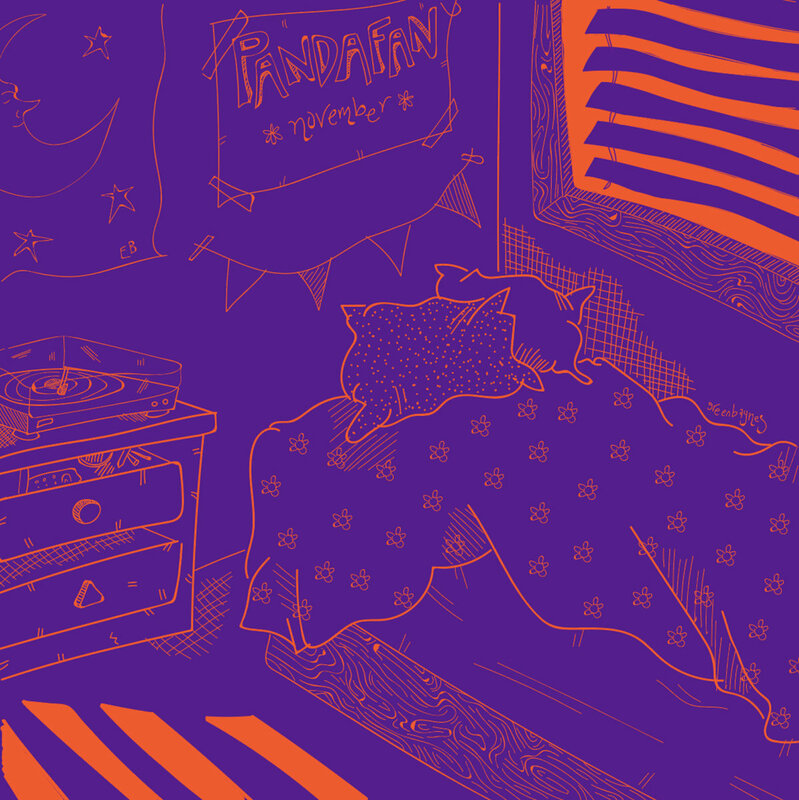 In much the same fashion, New York based indie folk band, Pandafan, has put itself out there long enough to have created and sustained a set of its own reliable expectations when it comes to the band’s music. Initially bursting onto the music scene with a keenly lined up an assortment of influences like Fleet Foxes, First Aid Kit, and Little Green Cars, this group writes with a tried and true level of commitment to sonically ethereal and acoustic-centric folk. Now standing at the edge of a new milestone in Pandafan’s story with a lineup change that includes the introduction of three new members, the drastic amount of addition might feel daunting. However, new single “November” illuminates Pandafan’s continuing devotion to the signature sound that makes the band what it is. Clocking in at close to four minutes in length, Pandafan waste no time gathering listeners in with an instrumental introduction that ushers in a familiarly gossamer quality. Nearly a minute devoted to just this beginning statement, there’s a freeform lightness to the beginning – not just from the minimal note movement and relaxed tempo but from the choice of sustained, clean tone put on Hafener’s electric guitar. The quieter nature of Pandafan’s previously acoustic fuel is there but the sounds themselves are given more room to roam thanks to the small boost from electric effects and digital expansion. It’s well done and proves to listeners that just because Pandafan plugs in, and is expanding down to bass-level registers, the band isn’t ditching their delicate demeanor. One could liken the way the sounds play out now, as opposed to some of the band’s past tracks, as like viewing a landscape scene painted in watercolor over the same scene done with impressionist techniques. Though both are different, there’s a shared gentleness between the before and the now. The sustain and delay-heavy shaping throughout “November” is almost meditative and reminiscent of musical character like that of William Tyler’s Impossible Truth (Merge Records, 2013). Having said and acknowledged these real-life related explanations, from a purely musical and production based point of view,“November” is written with enough of a legato style directive that the song almost demands something sonically similar but with more girth, like a slide guitar, pedal, or lap steel. Complementing the change in Pandafan’s lineup, if the newly formed quintet were to mix in a few previously unexplored instruments such as these, that kind of decision would have made for the perfect opportunity for Pandafan to expand and change its sound in a way that wouldn’t come off spontaneous, extreme or confusingly out of character. Then, if the sounds didn’t fit well with more songs going forward, such inclusion could be looked back on merely as creative experimentation. Still, just because the way Burgess, Steen, and Baratali emerge within the ranks of Pandafan is more a thing of subdued arrangement nuance than explosive evolution, that doesn’t mean the band can’t decide to open the orchestration floodgates in the future to give more decisive illumination of the trio’s newly drafted musical talents – particularly Burgess’s experience vocal jazz, which would be the most unexpected element to breach Pandafan compositions down the line. The potential for the new group is unquestionably exciting. In the meantime, this notably chorus-less tune is a delightful re-emergence by the group since last year’s Ocean B-Sides release. The lyrics have a touch of traditional ABCB rhyme scheme but Hafener doesn’t even hold herself hostage to this one standard across the track’s three stanzas (Spending every night on my own / Turning off the lights in my room / Thinking of what else is out there / I’d like to see but I cannot leave). In this way, the lyrical aspect of “November” takes the liberty to flow freely but does so without leaving the music craving and requiring a conventional hook to make the whole piece feel resolved. The sung portion of the song plays through like an unassuming poem and instrumental interludes act like extended bookends on either side. The first warms listeners up to Hafener’s inner thoughts. Then the second, more robust and sonically flourished end, subsequently guides minds away from the alluded to scenes and back out to the real world with calm “ooo” vocals, steady beating kick drum, trotting acoustic guitar strums, and rhythmically reserved but unwavering bass plucks. Despite being more than a complete thought and a fully developed musical idea, “November” feels almost like a teaser of a song. Not for its ratio of lyrics to instrumental breaks but for the shift in Pandafan’s approach to songwriting that is only just peering through. Here everyone is privy to a small taste of how the group could or could not choose to move forward on the next full project. It’s the perfect amount of new ideas and older comforts; no one knows what will come next but the music definitely tempts listeners to stick around for the real November and beyond to find out exactly what’s in store. November” is available now on iTunes and streaming on Spotify and Bandcamp. Recording was done at The Silo Studio.